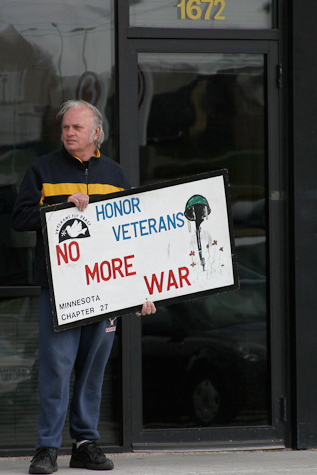 In a state wide initiative organized by the Twin Cities based Anti-War Committee, the Wednesday vigilers of the Twin Cities Peace Campaign's afternoon Bridge vigil and AlliantACTION's morning vigilers at ATK, joined together to resist at the West St. Paul recruiting station on Robert Street. Below is a timeline of the day, followed by a few images. • 9 AM: We arrive and go inside to introduce ourselves. The Army guys said they were not interested in ANY dialog "with YOU people". The Air Force was more pleasant. We never saw the Navy or Marines. • 9:30: One of our group goes in and asks if the coffee is ready yet. It's not and he is asked to leave. 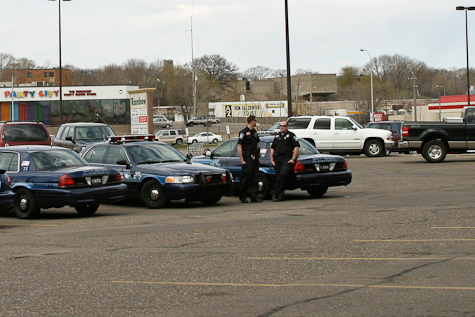 • 9:35: Five squad cars arrive from West St. Paul Police. The Officer in Charge (OiC) goes inside and remains there for about 10 minutes. When he finally comes back out, he explains we are on private property. 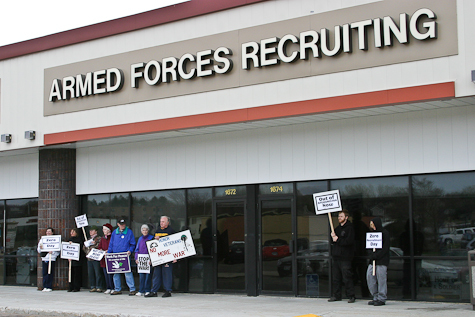 He tells us the recruiters do not want us inside, but they have no problem with us remaining on the sidewalk outside, provided we don't block the door. The OiC then goes back inside the offices. • 9:50: OiC re-emerges from the offices. He explains even though we can remain on the sidewalk directly in front of the recruiters offices, we need to understand we are still on private property and if the property manager wanted us off the property we would have to leave. And then reminded us again we could not go inside the offices. 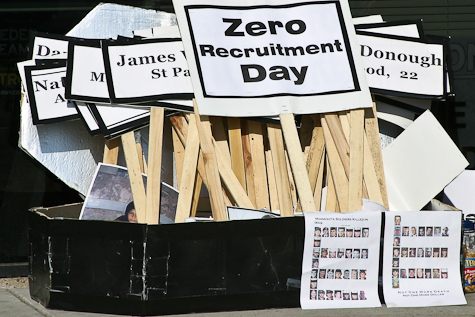 Almost in the same breath, suddenly he says "you have to leave the property right now.The best place for you would be on Robert Street" (note: the street is almost a half block away, with no connection to the recruiters office). A member of our group explained the legalities of such an order to the officer. The response was "'you need to leave the property right now. The best place for you...." He turned and went back to his car. We decided to stay where we were to see what would happen. 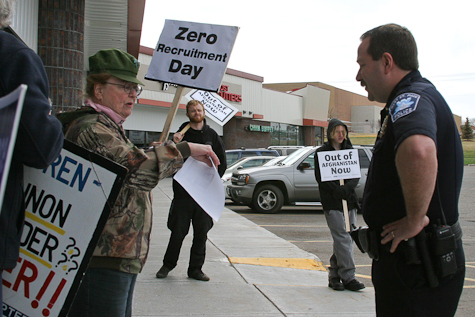 • 10 AM: Air Force recruiter opens the door to say good morning. He's wearing a POW/MIA Tshirt. Steve from Veterans for Peace is able to engage him in a short conversation. • 10:05: New Officer in Charge (OiC2) arrives, Greets us with a smile as he enters the offices. • 10:15: OiC2 emerges from the offices and makes a comment about the weather to us (it was cold in the morning). He then heads over to OiC's car, has a short conversation and leaves. • 10:25: OiC approaches the group and asks "What do you people want us to do?" Someone mentions arresting the real criminals of war. He replies "Do you want to be arrested? What do you want?" 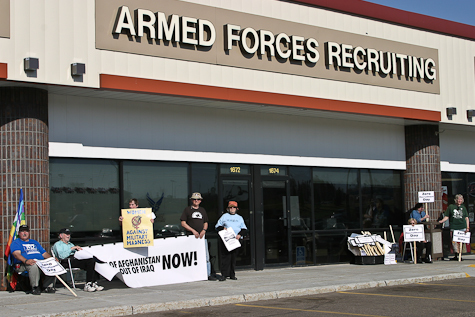 We respond, "We want the the ability to educate potential recruits and the general public about recruiting lies and the unjust wars in Iraq and Afghanistan." He then asks "Would you stay out of the office and not block the door?" Most of us respond that that would be okay. • 10:55: Last squad car finally leaves but returns throughout the day and sits in the parking lot for 15 minutes or so at a time. A couple of times, the OiC returns to remind us not to enter the offices or block the door. • 4:30 PM: The office was scheduled to close at six, but from inside the building we heard the doors being locked. We had distributed over 200 informational flyers throughout the day. • 4:55: West St. Paul Police arrive and enter the building, relocking the door behind them. With our plan to storm the office at 5:03 thwarted, we implement plan B. 9 images. © 2009 tBottolene/CircleVision.org. All rights reserved. We began at 9 AM. Three of the six squads that 'responds' and stayed for almost an hour. 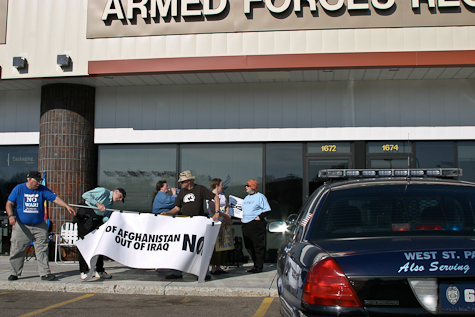 A member of AlliantACTION educated a West St. Paul police officer about depleted uranium and the effects it can have on American soldiers. 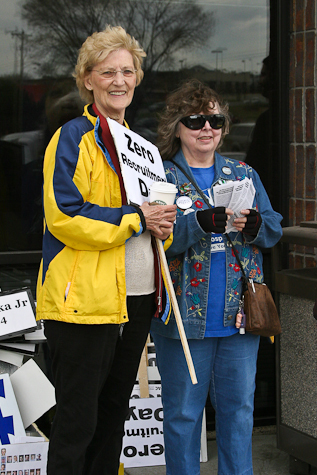 Marie Braun from the Twin Cities Peace Campaign (left) and AlliantACTION member Jeanne Hynes. 4:50 PM, after being in front all day. 4:55 PM, the police arrive and we decide to pack it up.